It has parking for 2 cars and secure outside decking complete with table, chairs and parasol for your enjoyment. The caravan has two bedrooms (the main bedroom has a 5' king size bed and one twin bedroom) plus a sofa bed in the living area. The main bedroom has ample storage with several wardrobes and drawer units and an en suite toilet with basin. The twin bedroom also has a wardrobe, dressing table area and 24" colour TV. In the bathroom you will find a large, walk-in power shower with hand basin and toilet. There is a dining table with four chairs to the side of the kitchen area, which leads into the living area. Here you will find a wrap around sofa with ample seating for 6 people, an electric fire, coffee table, storage space etc., along with a 43" Smart TV. We aim to operate a Friday or Saturday start date dependent on other bookings. Weekend (Friday to Monday) and mid-week (Monday to Friday) breaks are available on request, a minimum of three nights. A breakage deposit of £50 is also required, which will be returned within 14 days of the caravan being checked and everything found to be in order. One bathroom with power shower, toilet and basin. En suite toilet and basin to main bedroom. We really enjoyed our short break. The caravan is well looked after and was spotless when we arrived. We had everything we needed, it felt like a home from home. The site is very clean and peaceful and in such a great location. We couldn’t fault anything. It was our girls’ first stay in a caravan and they thoroughly enjoyed it. Would highly recommend. Thanks for a lovely stay! We had a super long weekend break in this lovely caravan. It was very clean and tidy and much bigger than pictures can do justice to it. Ok, the twin bedded room and the beds in it were quite small but perfectly adequate for a good nights sleep. The location is very quiet being situated towards the far end of the Shorefield estate and close to a very nice path into the woodland and down to the coast. The bathroom and shower were surprisingly larger than expected with a good flow of hot water. A nice large LCD TV in the lounge although no DVD player. However, although I did not try it there was an XBOX connected to the TV so perhaps DVDs can be played that way. Well equiped kitchen with large fridge freezer and a very efficient gas hob and oven. Super caravan, great value for money and would easily stay there again. Thank you so much for the lovely review and we are so glad you like the caravan and location as much as we do. Have taken on board about the DVD player and will look into it. You would be very welcome to stay any time. Great experience making it a lovey trip. 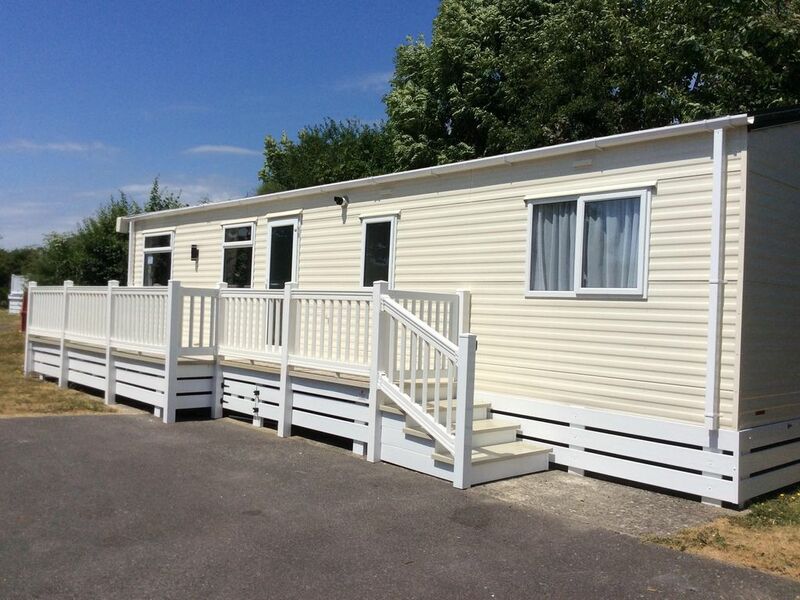 Beautiful clean and well kept caravan with lovely helpful owners. Site very nice enjoyed by adults and children. Really glad we choose to stay and would happily stay again. Thank you. We are so glad you enjoyed your stay and that everything was smashing. You will always be welcome. The caravan is very comfortable & clean, the site well maintained. Interior of caravan was spotless and supplied with everything you need for your holiday. The owners were extremely helpful. The location is brilliant. If you want a nice place that's quiet and in a good location, then this is the place to stay. We generally don't go back to places but on this occasion probably will and would highly recommend. Thank you very much. We are so glad you enjoyed your stay. We try hard to make the caravan as perfect as possible and it is always nice to find that it has been enjoyed as much as we enjoy it. You would always be very welcome to return. We only stayed for a night but were really pleased. A lovely caravan, clean, tidy and spacious with everything you need. A lovely friendly site with lots of facilities. So glad you enjoyed yourselves and glad we could help. Anytime you want to come back, we would be very happy to accommodate you again.